More than 150 Audio files in this lesson. A summary text file with audio file names, Burmese script, Romanization, and meaning in English. 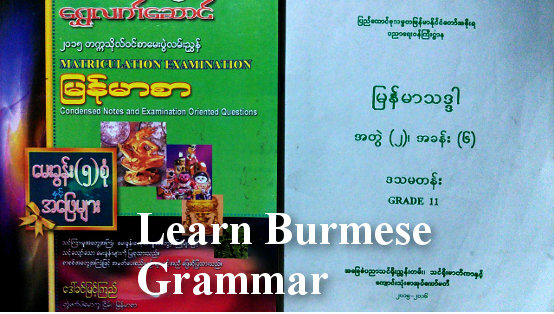 There are a number of studies on Burmese grammar မြန်မာသဒ္ဒါ | myan2-ma2 tha1-da2 from the English language point of view. Usually, those studies explain the structure of the Burmese language with English grammar classifications and terminologies that English speakers are familiar with. It's not easy to explain the Burmese grammar that way. And, it's not easy to understand it that way either. The reason is because in addition to being different in the word order, Burmese language has extra "jigsaw puzzle pieces" called particles (ပစ္စည်း | pyit-si3) and postpositional markers (ဝိဘတ် | wi1-but) that do not exactly fit nicely into the pattern of English grammar rules and classifications. Here is a different approach. I will put more stress on those suffixes and ending words as central importance to master the Burmese grammar. They have multiplier effect in that once you see the backbone structure of phrases and sentences using those essential words, you can substitute other words with less effort. Based on this foundation, you can always build up other vocabulary consisting of verbs, nouns, adjectives, and so on. For serious learners of the Burmese language, those particles and postpositional markers should be among the top 100 Burmese words that they should learn first. Parts of Speech in Myanmar Language and classifications are well established. I am using several references to check for the accuracy of the materials presented here. The references include နဝမတန်း မြန်မာသဒ္ဒါ | 10th Grade Myanmar Grammar book (2014-2015) and ဒသမတန်း မြန်မာသဒ္ဒါ | 11th Grade Myanmar Grammar book (2015-2016) published by the Ministry of Education, Myanmar-English Dictionary (2011) and မြန်မာအဘိဓာန် | Burmese-Burmese Dictionary (2013) by the Myanmar Language Commission, as well as ၂၀၁၅ တက္ကသိုလ်ဝင်စာမေးပွဲလမ်းညွှန် | 2015 College Entrance Exam Preparation Materials (2014) written in the Burmese language by the retired Myanmar language professor Daw Khin Myint Kyi. § 1. The first type of Burmese Verbs are action words. They are called ပြုခြင်းပြကြိယာ | pyu1-chin3 pya1 kri1-ya2. Words in this category are come, go, eat, run, read, write, etc..
Action words may have nouns in front to avoid ambiguity. Many of those nouns become part of the verbs. Related nouns for the actions are always in front of the verbs. § 1.1. Verbs can exist as stand alone words, usually as commands: သွား | thwa3 - Go! Get out! ဆုတ် ဆုတ် ဆုတ် | hsoat, hsoat, hsoat - Very common usage telling the driver that there is ample space and it's OK to reverse the car. It's very clear that the car is in reverse gear, and it is not a suggestion telling the driver to back up the parked car. What are those words after the verbs? Just one or two extra words and they seem to convey different meanings. ပြီ pyi2 (read: byi2) Postpositional Marker to show action is or has taken place. Those words are part of "backbone structure" of Myanmar grammar. The verb သွား | thwa3 (go) can be replaced with some other verbs like စား | sa3 (eat) in most of the above examples. တယ်၊ ပြီ၊ မည်၊ မယ်၊ သည်၊ လတ္တံ့၊ လိမ့်မည်၊ လိမ့်မယ်၊ ၏၊ အံ့ | deare2, byi2, myi2, meare2, dthi2, la1-tan1, lain1-myi2, lain1-meare2, e1, un1. Those are classified as ကာလပြကြိယာဝိဘတ် | ka2-la1-pya1 kri1-ya2 wi1-but meaning Postpositional Markers that show time. စားပြီးပြီ | sa3 pyi3 byi2 - (I) have already eaten. စားခဲ့တယ် | sa3 kheare1 deare2 - (I) definitely have eaten. မှာထားမယ် | hma2 hta3 meare2 - I will go ahead and make an order. ယူလာခဲ့တယ် | yu2 la2 kheare1 deare2 - (I) have definitely brought it. ယူလာခဲ့မယ် | yu2 la2 kheare1 meare2 - (I) will definitely bring it. လာခဲ့မယ် | la2 kheare1 meare2 - (I) will definitely come. လုပ်မိတယ် | loat mi1 deare2 - (I) have done it by mistake. သွားတော့မယ် | thwa3 dau1 meare2 - (I am) about to go. သွားနေတယ် | thwa3 nay2 deare2 - (I am) going; I am on the way. သွားနှင့်မယ် | thwa3 hnin1 meare2 - I will go ahead first. သွားပြီ | thwa3 byi2 - I am leaving now. သွားမယ် | thwa3 meare2 - I will go now; Good bye! ; Let's go! ခဲ့ kheare1 particle meaning "definitely" used as an emphasis where ခဲ့တယ် | kheare1 deare2 is the past tense, and ခဲ့မယ် | kheare1 meare2 is the future tense. ခဲ့ | kheare1 modifies တယ် | deare2 into past tense. တော့မယ် dau1 meare2 Particle + Postpositional Marker to indicate future action or event which is about to happen. ထား hta3 Particle used to refer to a prior one time action which is in process to the present. E.g., I have ordered food at the restaurant. It refers to the prior act of making the order and 'waiting' is implicitly implied. နေ nay2 Particle to show continuing process. နေတယ် | nay2 deare2 is equivalent of present participle: "-ing" in English. E.g., I am waiting. ပြီး pyi3 Particle to indicate completion of action. ဖူး pfu3 Particle to show that a person has done or experienced something. မိ mi1 Particle to indicate a mistake made or something happened by chance in recent past. လိမ့်မယ် lain1 meare2 Postpositional Marker to show anticipation or expectation of future action or event that is not within one's control. သွား thwa3 Particle to show that certain act has been done, or certain state has been reached. Those end of sentence particles are known as ဝါကျနောက်လိုက်ပစ္စည်း | wet-kja1 nout-lite pyit-si3. See more fun examples in lesson 3. Compare hnin1 used in this negative sense to hnin1 used in the positive sense. § 1.7. In general, negative statements are constructed with the prefix မ | ma1 as in negative imperatives and prohibitions. This prefix is called အငြင်းပြပစ္စည်း | a-nyin3-pya1 pyit-si3 meaning "particle that shows argument". မလိုချင်ဘူး | ma1 lo2 chin2 bu3 - I don't want it. မလိုဘူး | ma1 lo2 bu3 - No need. မလိုတော့ဘူး | ma1 lo2 dau1 bu3 - I no longer need it. မလိုသေးဘူး | ma1 lo2 thay3 bu3 - I don't need it yet. § 1.8. plurality of the verbs are indicated by the suffix words ကြ | ja2 in colloquial form, and ကုန် | kone2 or ကြကုန် | ja1 kone2 in literary form. Those suffix words are called ကိန်းညွှန်းပစ္စည်း | kane3-hnyoon3 pyit-si3 meaning particles that indicate numbers. Depending on the writing style and the flow of the sentence, those particles may be omitted. ထမင်းကျက်ပြီ | hta1-min3 kjet byi2 - The rice is cooked! kjet is the verb cooked, but it must be followed by the postpositional marker byi2. This last word byi2 indicates that the action is or has taken place. This postpositional marker is further classified as ပစ္စုပ္ပန်ကာလပြ ကြိယာ ဝိဘတ် | pyit-soat-pan2 ka2-la1-pya1 kri1-ya2 wi1-but - verb-suffix to show present tense. ဖြစ် | pfyit - second type of Myanmar (verb) "is" that shows state, condition, or occurrence. မောင်ဘသည် မြန်မာလူမျိုးဖြစ်သည်။ | moun2-ba1 dthi2 myan2-ma2 lu2-myo3 pfyit dthi2 - As for Maung Ba, he is a Burmese. Note that there are two dthi2 words. The first dthi2 makes Maung Ba a ကတ္တား | kut-ta3 or "subject" in active mode, as opposed to ကံ | kun2 or "object" that is acted upon by an action. If Maung Ba was kicked, he would have been an object. The ending word dthi2 shows that Maung Ba is either a living person in the present or someone in the past. သူအသားဖြူ၏။ | thu2 a-tha3 pfyu2 e1 - He/she has fair skin. In this example, adjective ဖြူ | pfyu2 is modified into the verb of the second type (that shows something "is" the way it is) by the postpositional marker ၏ | e1. In translation, this last ending word seems to correspond to the verb "has" in English. It may be possible to take it as "has" in computer translation algorithms, but since it is not a verb in the Burmese Language, the logic will not be consistent and fail in some other sentence constructions. သူကား သူတော်ကောင်း တည်း | thu2 ga3 thu2-dau3-goun3 de3 - He is a saint, indeed! ရွှေတိဂုံဘုရားသည် ရန်ကုန်မြို့၌ တည်ရှိသည် | shway2-da1-gome2 pfa1-ya3 dthi2 yan2-gome2-myo1 hnite ti2-shi1 dthi2 - Shwedagon Pagoda is located in Yangon. ပင်ကိုကြိယာ | pin2-ko2 kri1-ya2 - words that describe the act. E.g., စား၊ ကစား၊ သွား၊ နား၊ | sa3, ga1-za3, thwa3, na3 - eat, play, go, rest, etc..
ဂုဏ်ရည်ပြကြိယာ | gome2-yay2-pya1 kri1-ya2 - words that show the quality. Those words are modified adjectives as shown in example 3 of § 2 above. English equivalent would be: "is red"; "is sweet" "is beautiful", etc.. Those are (verb + adjective) combination in English grammar. ပေါင်းစပ်ကြိယာ | poun3-sut kri1-ya2 - words that combine two actions. E.g., sa3-thout - (eat + drink) or "to have a meal" (verb + verb) as a whole is taken as a verb. sa3-thout hsine2 ( verb + verb + noun) refers to the restaurant (noun) meaning a shop where you eat and drink. § 5. A verb can be followed by an another verb. It is possible to combine more than two verbs, and up to six verbs one after another is still a good writing style in the literary Burmese sentences. Some of the usages give expressive animated actions of verbs in sequence that are unheard of in the English Language. NOTE: Some of the verbs that follow verbs are taken as particles. § 6. While English has just a question mark symbol, Burmese language has different types of question particles at the end of sentences. အသင်လူလော၊ နတ်လော | a-thin2 lu2 lau3 nut lau3 - Are you a human, or an Angel? ခဲ kheare3 သွားခဲတယ် | thwa3 kheare3 deare2 - I seldom go. ခဲ့ kheare1 ယူလာခဲ့တယ် | yu2 la2 kheare1 deare2 - I definitely have brought it. ခဲ့ kheare1 ယူလာခဲ့မယ် | yu2 la2 kheare1 meare2 - I will definitely bring it. ချင် chin2 သွားချင်ပြီ | thwa3 chin2 byi2 - I want to go already. တော့ dau1 စားတော့မယ် | sa3 dau3 meare2 - I am about to eat. တတ် tut လုပ်တတ်တယ် | loat tut deare2 - He can (knows how to) do. ထိုက် htite လေးစားထိုက်တယ် | lay3-za3 htite deare2 - It's fitting and proper to respect (him). နိုင် nine2 လုပ်နိုင်တယ် | loat nine2 deare2 - He can (has the capability to) do. ပါ ba2 စားပါ | sa3 ba2 - Please eat. ပေး pay3 လုပ်ပေးပါ | loat pay3 ba2 - Do this for me (on my behalf) , please. ပစ် pyit စားပစ်လိုက် | sa3 pyit lite - eat it all by all mean without holding back. ပျော် pyau2 သေပျော်ပါပြီ | thay2 pyau2 ba2 byi2 - I can die happily now after fulfilling the wish and/or duties. ပြန် pyan2 လုပ်ပြန်ပြီ | loat pyan2 byi2 - He does it again! Not again! ဖူး pfu3 လုပ်ဖူးတယ် | loat pfu3 deare2 - I (have previous experience); I have done it before. ဖို့ pfo1 သွားဖို့ပြင် | thwa3 pfo1 pyin2 - prepare (for the purpose) to go. မိ mi1 ပြောမိတယ် | pyau3 mi1 deare2 - I mistakenly have said it. ရ yah1 တွေးရခက်တယ် | tway3 yah1 khet deare2 - It's difficult to think and reason it out. (Difficulty to have capability to reason on this subject.) yah1 roughly means "can be done". ရဲ yeare3 လုပ်ရဲတယ် | loat yeare3 deare2 - I dare to do. ရက် yet လုပ်ရက်တယ် | loat yet deare2 - How could you do such a cruel and inconsiderate thing? ဝံ့ woon1 လုပ်ဝံ့တယ် | loat woon1 deare2 - I dare to do. လွန်း loon3 ရက်စက်လွန်းတယ် | yet-set loon3 deare2 - He is too cruel. လို့ lo1 စားလို့ကောင်းတယ် | sa3 lo1 koun3 deare2 - It's delicious. As for carrying out that action (eat in this case), it is good. သေး thay3 လုပ်နိုင်သေးတယ် | loat nine2 thay3 deare2 - He (emphasis) still can do it. သင့် thin1 လုပ်သင့်တယ် | loat thin1 deare2 - You should do it. သွား thwa3 ပြန်သွားပြီ | pyan2 thwa3 byi2 - He has left. He has done the act of leaving. ဦး ome3 ပြောရဦးမယ် | pyau3 yah1 ome3 meare2 - I must tell you this first; I can't wait to tell you this.